Towards July-end, when extreme heat and the late arrival of monsoons caused power consumption to reach record levels, peak supply fell short of demand and grids across India failed. It was the most severe power outage in memory, but is not likely to be a one-off incident. As the world faces the challenges of global warming, energy availability will become less certain and the scenario will worsen. A study by the Asian Development Bank (ADB) warns that the energy sector, commonly associated with greenhouse gas emissions, is vulnerable to changes in climate. It assessed the impact of climate change on power sector in Asia-Pacific and found much of the energy infrastructure is located in areas where weather pattern may become increasingly variable. It identifies India, Bangladesh, Cambodia, the Philippines, Nepal, Myanmar, Vietnam, Papua New Guinea and Indonesia as high-risk countries. According to the World Business Council on Sustainable Development, global energy demand by 2050 could double or triple as population rises and developing countries expand their economies and overcome poverty. Electricity demand in Asia is growing rapidly, with a projected average increase of 3.4 per cent annually through 2030, and this will require an investment of US $3.3-4.6 trillion, says the ADB report. The increasing demand will be met majorly by coal-fired power plants. This is because thermal sources will drive growth, which is an imperative for developing countries. In India, only 67.3 per cent people has access to electricity as per the 2011 census. Coal-fired power plants account for 55 per cent of the country’s installed capacity, according to a report by the Working Group on Power for the 12th Five Year Plan. The report also predicts there will be a shortfall in availability of coal, which the government would have to meet through imports. However, it is feared that the gap will only increase, because climate change will impact mining activities as well as power plant infrastructure. The scenario will be the same across the Asia-Pacific region, where despite growth of renewable energy, coal-based power is expected to account for nearly 80 per cent of the energy use in 2030. Going by precedents, too much rainfall can degrade the quality of coal stockpiles by increasing moisture content. It can also affect mining and transportation of coal. In 2010, heavy rainfall in Korea inundated more than 30 coal mines and washed away hundreds of thousands of tonnes of coal from some 40 coal yards. Pumping equipment became defunct due to lack of electricity. Coal transportation came to a halt as bridges and rail lines were damaged by landslides. Similarly, in Indonesia, heavy rains and flooding in Kalimantan in late 2010 and early 2012 shut down mines, reduced output and affected coal transport. There are concerns that changing weather patterns may spread rain more equally throughout the year, with no dry season to make up for wet season losses. Oil and gas facilities will not be spared either. According to the ADB report, low-lying coastal areas such as Jamnagar in India and Jurong Island in Singapore, which house critical oil and gas facilities, could face increased flooding, sea level rise, storm surges, ground subsistence and erosion. Even though pipelines are considered to be the safest method of transporting oil and natural gas, flooding and resulting soil erosion can damage valves, pump stations and other equipment. The power plants will suffer even in the event of decreased rainfall. Even though the water requirement in power plants depends on the power generation and cooling technologies and their capacity, the amount of water required will still be considerable. But projects do not factor in the imminent water stress at present. “Thermal power plants work on the basis of economics. Although water is an important component of environmental impact assessments (EIAs), they do not quite focus on weather variability and possible impacts, which they should,” says A K Ghosh, advisor, Quality Council of India, which gives accreditation to EIA consultants. Hydropower plants will also be directly affected by any changes in precipitation and temperature. As reservoir capacity gets affected because of lower snow melt or lower river flow, hydropower generation will dwindle. The impact will be severe on small hydropower projects as they depend on seasonal rivers, which can dry up quickly with higher temperatures and recurring droughts. But none of these impacts are taken into consideration while designing hydropower plants, notes a paper on climate change, disasters and electricity generation published by Strengthening Climate Resilience, a programme that aims to build communities’ resilience to disasters. On the nuclear energy front, availability of freshwater and safety are issues of primary concern. An initial evaluation of the 2011 Fukushima-Daichii nuclear plant accident, by Massachusetts Institute of Technology in the US, shows it is crucial to choose sites that are away from highly seismic areas and coasts. Since seawater is corrosive, freshwater is required for the cooling of the nuclear reactors. Any freshwater stress will thus affect the output of power plants and even lead to closure of reactors, the report says. In 2003 and 2006, as heat waves gripped France, it led to the limiting of output or closure of 17 nuclear plants. Seventy-seven per cent of France’s electricity comes from nuclear power. In 2009, France faced a shortfall of about eight gigawatts (1 GW equals 1,000 MW) of nuclear power and was forced to import electricity. The same year as heat waves gripped other parts of Europe, it threatened the stability of the national and regional electricity supply. Even renewable sources of energy like wind and solar photovoltaic power, biomass and biofuels could be hit. While solar photovoltaic technologies could be impacted by changes in cloud regimes, variation in photosynthesis or plant’s physiological interaction, often driven by changes in carbon dioxide concentration, could alter the energy density of biomass and the power generated from it. Apart from affecting electricity generation, high ambient temperatures and storms can damage transmission and distribution grids as well, causing power loss. And all this will happen when demand for electricity will soar due to rising temperatures. Inadequate attention to these impacts can increase the long-term costs of investments in the energy sector and increase the probability of failure under climate stress, warns the ADB report. It suggests adaptation measures, which include more robust designs of power plants; air or low-water cooling systems; inclusion of extra components in control systems which can be used in case of failure of an existing component; improved supply and end-use efficiency. ADB also recommends more robust operation and maintenance procedures, decentralised local planning, integration of adaptation and mitigation planning and integrating power sector planning with that of other sectors such as water supply and improved localised models to predict storms and flood hazards. There are many who advocate that the solution to the threat of climate change lies in moving away from fossil fuels. But it is not clear what technologies will provide impetus for such change or how much time such transitions will take to implement. The existing investments and plans for power generation should therefore fully account for climate change and, where cost-effective and practical, adopt approaches that are resilient to these projected changes. To attract rulers, it has become a fashion to use the word Ã”Ã‡Â£climate changeÃ”Ã‡Ã˜ to each and every sundry study by international agencies. This is used as an adjective. These agencies have plenty of funds. Weather is different from climate change. Weather extremes and cyclic variations are common phenomenon in Indian weather Ã”Ã‡Ã´ heat waves, cold waves, extreme drought, and extreme floods. All these are nothing to do with global warming. The so called global warming trend so far showed an increase by around 0.5 degrees Celsius and expected to go up to 1.13 degrees Celsius by 2100 superposed on it a 60 year cycle vary between -0.3 to +0.3 degrees Celsius. The extreme temperatures go beyond 5 degrees Celsius. Even IPCC has changed its stance on extreme weather vs global warming, now says it is 50 : 50 chance. 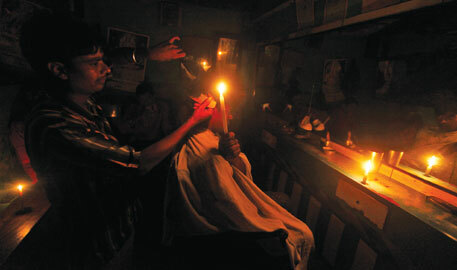 This year north India faced power outage due to mismanagement by power distribution agencies. It is nothing to do with weather as observed by the author of the article. UP utilized in excess and nobody bothered and thus crisis. But in no time it was restored back. In Andhra Pradesh the present power crisis is associated with political game. The chief Minister was simply watching when Coal mining, transportation crisis due to local political problem. Chief Minister visited on several occasions Delhi and met PM but never bothered on requesting for coal from other states or importing coal but more worried on getting permission to export rice to the tune of 30 to 40 lakh tons Ã”Ã‡Ã´ thousands of crores profit. As a result the government used water from reservoirs for power production far below dead storage level. This created now even the water problem along with no water for power production. At the same time the thermal power plants playing game Ã”Ã‡Ã´ every other day one part or the other going out of production. So, the present power crisis is political game. Let me present few points I presented at round table meet held on 28th August 2012 in Hyderabad as a moderator of the meeting. The topic for discussion was Ã”Ã‡Â£Thermal Power Plants: Environmental issuesÃ”Ã‡Ã˜. This topic was chosen with reference coal based thermal power plants along the ecologically sensitive coastal zones of Andhra Pradesh. Ã”Ã‡Â£India has enough resources to fulfill everyoneÃ”Ã‡Ã–s need but it canÃ”Ã‡Ã–t fulfill one personÃ”Ã‡Ã–s GreedÃ”Ã‡Ã˜ by Mahatma Gandhi. Here it is pertinent to mention the Greed of Krishnapatnam Seaport management, in violation of the consent order they started destroying the greenbelt including Reserve Forest that help in reducing the impact of pollution generated by seaport Ã”Ã‡Ã´ now A.P. High Court has taken up the issue under a suo-motto PIL. This is the case with Reliance on shore facilities near Kakinada wherein they uprooted mangroves in hundreds of acres. Same is the case with most of the projects in Andhra Pradesh and as well in India. We must keep this in mind while assessing the pollution impacts Ã”Ã‡Ã´ Environmental disaster. Population is growing unabatedly, more particularly urban population. To meet their needs under the new lifestyle developmental activities also needs to move in that direction. However, developmental activities must be sustainable to meet the future needs. That means there must be a balance between economic growth and environment. However, developmental activities in India are moving in the direction of creating wealth for few at the cost of environment. This must be changed. To achieve sustainable goal governments have put in force Acts and Laws and as well initiated plans in different fields. But, unfortunately, most of these are on paper only and ground realities are far from them. This is exactly what is happening even in power sector. Let me give three examples on how our industrialists give scant respect for environment: Reliance on-shore plant at Kakinada uprooted Mangroves in hundreds of acres against EC order of MoEF Ã”Ã‡Ã´ I submitted report on this to MoEF in 2006 but no action was taken against it; Krishnapatnam seaport management started destroying reserve forests Ã”Ã‡Ã´ AP High Court has taken up this as suo-motto PIL few weeks back; 1000 acres of Mangrove zone were allotted to a power plant near Kakinada Ã”Ã‡Ã´ I filed a PIL in AP High Court, government withdrew the allotment but by that time mangroves were cut in 70 acres Ã”Ã‡Ã´ now this plant was allotted land in APGenco Krishnapatnam land. Mangroves play important role in fishermenÃ”Ã‡Ã–s life and as well act as a protective wall against high tides. In the area of renewable energy, government of India made concrete proposals in National Action Plan on Climate Change that includes: energy saving, use of energy efficiency equipment, use of renewable energy in thermal power plants, renewable energy generation, etc. Gujarat is the leader in the solar energy grid connectivity and next comes the Rajasthan, third AP but Bihar is moving ahead of AP with US packages Ã”Ã‡Ã´ however, they are facing with poor quality panels. Wind energy area Tamil Nadu tops. AP is not moving in the right direction in these two areas as the central government put the burden of subsidy on state governments. We are looking at pocketing the subsidized funds. We are far behind the potential renewable energy. We are not pursuing in the right earnestly. Some argue that the cost of solar power is Rs. 15 to 18 which needs high subsidy. But the same people are forgetting the cost of destruction of environment & health hazards and water consumption in thermal power plants. Same way the subsidy component given by central government to nuclear power plants is not accounted. So far the average growth in power at all India level is 9.62% and at AP state level it is 11.97% -- which are 5 to 6 times to population growth rate. But yet government of India for future also put the power generation growth rate at 9%. This unfortunately does not take in to account correcting the factors such as efficiency of the plants Ã”Ã‡Ã´ which is around 60 to 70% only --, transmission losses/pilferage Ã”Ã‡Ã´ which is around 25% --, inefficiency in use, energy saving components. If we take into account all these in growth rate, it must be far less than 9%; may be put at twice the population growth rate!!! By this way we are wasting natural resources and increasing the pollution load in the atmosphere. In India in the past 5-years, upto 2011, MoEF granted EC for 210,000 MW which is 60,000 MW in excess Ã”Ã‡Ã´ that is by 40% in excess --. It is planned for 8,00,000 MW by 2031-32, which is 4 times to the present level. Maharashtra state stands in the 1st place in the power production. In AP total installed capacity is 17,500 MW of which APGenco share is 8,900 MW [around 50%] and APGenco planned to add19,626 MW by 2020 Ã”Ã‡Ã´ this includes 6,000 MW of nuclear power that needs re-look in the light of CAG observations on Nuclear Power Plants --. Along the East Coast of AP planned 33 power plants of 45,000 MW capacities. Among these 32 are coal based and one is nuclear power plant, which will be doubled later. Unfortunately even in water starved Vidharba region in Maharashtra planned to establish 71 coal based power plants with a capacity of 54,697 MW, which require water equivalent to irrigate 4 to 5 lakh ha . The proposed thermal power in AP is more than double the present power production level. East Coast, in general, is suitable for less or no pollution potential industries. Also, it is ecologically fragile zone. Also weather-wise it is highly prone to cyclonic activities with high tides & heavy rains with high wind speeds. Also, already this belt is polluted by bulk drugs, ports that serve import and export of mineral ores, transportation of such ores and several other industries like steel plant, etc in the northern zone. The southern part has already polluting activities like boiled rice plants, Aqua Farms, Krishnapatnam Seaport with coal and iron ore imports/exports/transportation etc. Most of the less polluting gas based power plants are in the hands of private companies, which are established in the middle part. This zone has several other high polluting industries as well seaports. Thermal power plants are water & energy intensive and high pollution potential industries. With the concentrated growth of such industries along with those already existing activities create severe environment destruction. As a member of APPCB Task Force Committee, I have seen the pollution issue with NTPC. Now in Visakhapatnam we are watching on TVs the pollution issue of NTPC & Ramky. We are watching the opposition to Sompet thermal plant and Hinduja thermal plants & nuclear power plant. Important pollutants from coal based thermal power plants are CO2, SO2, NOx Ã”Ã‡Ã´ ground level ozone, PM, Mercury, Lead, Arsenic. They cause several health hazards. Also cause damage to crops and soil, water and sea life through acid rain. There is a need to plant thick green belt around the power plant by tall trees. There is a need to adapt cleaner-greener technologies with minimal pollution Ã”Ã‡Ã´ for example energy intensive industries like thermal power plants must use alternate energy sources like solar energy in certain components functioning of the industry. In thermal power plants this can be up to around 30% by which that % amount of coal can be saved and thus pollution & ash could be reduced to that extent. The other major issue in the thermal power plants is ash ponds. On an average 30% of coal becomes ash, which could be used for other activities like brick manufacturing, cement industry, concrete making, etc. At all India level ash generated in the coal based power plants now is 175 million tons which is same as cement production Ã”Ã‡Ã´ 180 million tons capacity but production is 162 million tons. At present 19% of ash is used in cement production Ã”Ã‡Ã´ in Japan it is 100%. By using ash in brick manufacturing, we can save soil. Some proposed to establish cement industries alongside the coal based thermal power plants. It is like scratching the head with fire stick. Government must not look at new plants alone but look at saving the energy that may be equivalent to around 35% of production capacity as energy saved is produced. For example: Government must discourage high pollution potential with high water and energy intensive projects to create wealth for few; Under well irrigation farmers must be encouraged to follow micro-irrigation practices; Thermal power plants must use solar power to the extent of 30% equivalent of coal; We must follow energy saving/energy efficient equipment Ã”Ã‡Ã´ industrial, irrigation, domestic sectors; Government must improve the grid efficiency and operation of plants to 80 to 90% capacity along with reduction in transmission & pilferage losses; Government must plan the hydropower production in line with agriculture. This year with strikes in coal belt thermal power generation has come to a standstill position and in addition very frequently plants started malfunctioning Ã”Ã‡Ã´ suspicious and thus water in the reservoirs were emptied by producing hydropower indiscriminately. Now there is no water for irrigation or power production Ã”Ã‡Ã´ mismanagement of reservoirs water. We need a sustainable development. We must assess thermal power plants in this direction. Therefore, there is a need to re-look in to all these issues.